LAS VEGAS – September 20, 2018 – The philanthropic spirit that captures the room at Barrett-Jackson auctions will be on full display during the 2018 Las Vegas Auction with a variety of activities and charity cars set to cross the block Sept. 27-29, 2018, at the Mandalay Bay Resort and Casino. Leading the charge into Las Vegas as part of the last stop for Barrett-Jackson’s yearlong Driven Hearts charity campaign benefiting the American Heart Association is a special 50th Anniversary Edition Ford Shelby GT350 (Lot #3003). 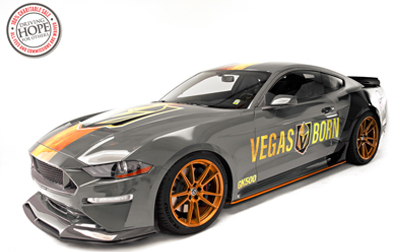 Also featured is the charity sale of a 2018 Ford Mustang GT Coupe Premium (Lot #3004), presented with a one-off custom Las Vegas Golden Knights wrap, that will benefit the local Las Vegas community with 100 percent of the sale benefiting Grant a Gift Autism Foundation. The Driven Hearts campaign, unveiled at the 2018 Scottsdale Auction and spearheaded by Barrett-Jackson’s Vice President of Brand Strategy Carolyn Jackson, will include multiple layers in Las Vegas, highlighted by a 2015 Ford Shelby GT350 (Lot #3003). The vehicle, one of 137 produced, commemorates the 50th anniversary of the Shelby GT350 and will cross the block at 1:30 p.m. on Saturday, Sept. 29, with 100 percent of the hammer price benefiting the AHA. Additional elements of the Driven Hearts campaign will include Craig Jackson’s Bugatti wrapped with a Driven Hearts livery, commemorative license plates with the letters “STRONG” and shirts available for purchase at the merchandise locations, with a portion of sales benefiting the AHA. In addition, cash drop-box locations will be on-site and fans can donate by texting “DrivenHearts” to 41444. The Golden Knights captivated Las Vegas and the sports world during its inaugural National Hockey League season with an exhilarating run to the 2018 Stanley Cup Final. Players from the team will be on-site Saturday, September 29, to sign autographs and support the charity sale of a 2018 Ford Mustang GT Coupe Premium (Lot #3004) at 3:30 p.m. The vehicle features a one-off custom Golden Knights wrap with the team’s logo and the words “Vegas Born,” and 100 percent of the sale will benefit the Grant a Gift Autism Foundation, dedicated to helping children, young adults and their families master autism to reach their full potential. Full details of the autograph session will be released on a later date at Barrett-Jackson.com. Two additional vehicles will sell in support of Barrett-Jackson’s Driven Hearts campaign in Las Vegas. At 5:30 p.m. on Friday, a beautifully restored 1956 Ford Thunderbird Convertible (Lot #3002) will cross the block featuring a rebuilt 312ci 8-cylinder engine and automatic transmission. The entire sale will benefit the AHA and Regional West Foundation. At 5:30 p.m. on Saturday, a 31-foot 1995 Celebrity 310 Sport Cruiser Boat (Lot #3005), featuring new twin 305ci 4-barrel 220hp engines, newly rebuilt lower units and refurbished electrical and pumps, will sell with 100 percent of the hammer price benefiting the AHA. Charity sales kick off Thursday, Sept. 27, at 3:30 p.m. with a 2018 Ford F-150 XLT Pickup (Lot #3000), the first edition of the custom-built Petty’s Garage Warrior F-150. Designed in tribute to the U.S. military and sold exclusively to the military through Military AutoSource, 100 percent of the sale will benefit Paralyzed Veterans of America. Crossing the block at 3:30 p.m. on Friday is a one-of-a-kind 2018 Can-Am Spyder F3-T 3-Wheel Motorcycle (Lot #3001), featuring a special Road Warrior Limited Edition hero-themed custom paint, custom-painted body, custom wheels and custom accessories. The entire sale of the Can-Am Spyder will benefit Project Road Warrior Foundation, Inc. More information about the charity vehicles can be found at Barrett-Jackson.com. The 2018 Las Vegas Auction Docket is now live. Advance tickets and All-Week ticket packages are also available at Barrett-Jackson.com. Consignments for the 2018 Las Vegas Auction are now sold out. Consignments are being accepted for the 2019 Scottsdale Auction; to submit an application, click here. For information on becoming a bidder, visit www.Barrett-Jackson.com/bid. Also, follow Barrett-Jackson on Facebook, Instagram, LinkedIn and Twitter for the latest news and information heading into the 2018 Las Vegas Auction.